Observation - kitenet - European Pear Rust - 14th September 2008 - UK and Ireland. Description: The rust fungus Gymnosporangium sabinae causing a gall on a leaf of a cultivated Pear (Pyrus) tree. Photos show upperside and underside of the leaf and gall. I like the colours. 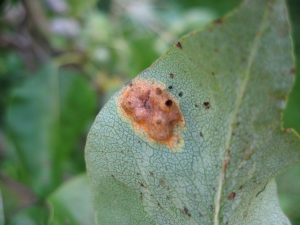 The rust fungus Gymnosporangium sabinae causing a gall on a leaf of a cultivated Pear (Pyrus) tree. Photos show upperside and underside of the leaf and gall. I like the colours.